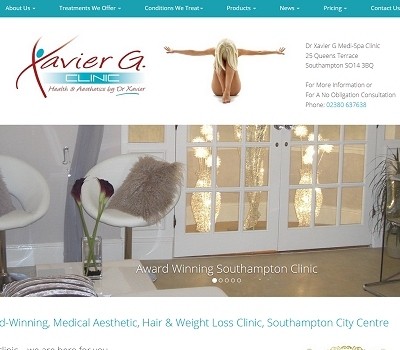 The Dr Xavier G. Medi-Spa clinic, in central Southampton, is a UK multi-award-winning doctor-owned private clinic - offering a wide range of medical cosmetic, skin health, health and wellness and preventative treatments for the face, body, hair and inner health. All our treatments and services are designed to restore, maintain and improve your health and well-being. The clinic offers other health and weight loss treatments such as Alevere Therapy - a medical weight-loss treatment that helps you to lose weight in a safe way as well as helping to reshape and contour your body without surgery - with all the health benefits that a healthier weight can bring. The Pink Studios is a team of well established beauticians based in Hayling Island. Originally founded by Hannah Walker in 2008, The Pink Studios has grown from a home based beauty salon open to friends and family to the contemporary, tranquil salon that it is today, opening its doors to locals in Hayling Island. Our reputation for offering professional, high standard beauty treatments has grown over the years and we are well known for offering these treatments to make you look and feel your best. All members of the The Pink Studios team are highly qualified beauticians and are all dedicated to providing you with a relaxing experience, no matter what beauty treatment you are visiting us for. 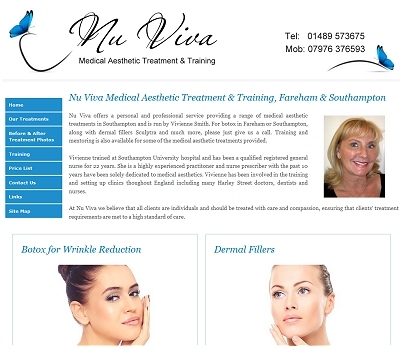 For botox in Fareham or Southampton, along with dermal fillers Sculptra and much more, please just give us a call. Training and mentoring is also available for some of the medical aesthetic treatments provided. 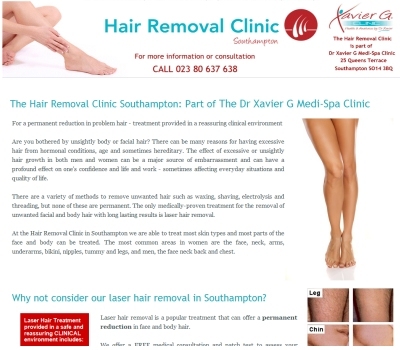 For a permanent reduction in problem hair - treatment provided in a reassuring clinical environment Are you bothered by unsightly body or facial hair? There can be many reasons for having excessive hair from hormonal conditions, age and sometimes hereditary. The effect of excessive or unsightly hair growth in both men and women can be a major source of embarrassment and can have a profound effect on one's confidence and life and work - sometimes affecting everyday situations and quality of life. There are a variety of methods to remove unwanted hair such as waxing, shaving, electrolysis and threading, but none of these are permanent. The only medically-proven treatment for the removal of unwanted facial and body hair with long lasting results is laser hair removal. At Susan's of Gosport we offer wedding dresses, bridesmaids dress, prom dresses and evening wear. Our professional and personal consultation will help make your wedding dreams come true. Let us take the stress out of co-ordinating the whole look for your wedding. We offer a full service and complete solution, starting with your own wedding dress and incorporating the whole bridal party. 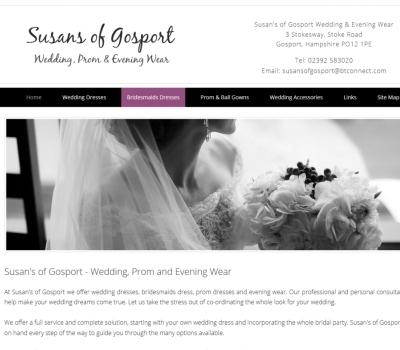 Susan's of Gosport will be on hand every step of the way to guide you through the many options available. Active 8 Wedding Cars Southampton, based in Hampshire, provides wedding cars throughout the Southampton area. Our fleet of wedding cars are ready and waiting to provide you with luxurious travel for your wedding day. Choose something that you will never forget - choose a gorgeous wedding car for hire and make it a day to remember! We believe that we have some of the most beautifully presented wedding cars in Southampton and we are proud to present our latest addition, a stunning Chrysler 300C - the perfect sophisticated, elegant choice for a wedding car. 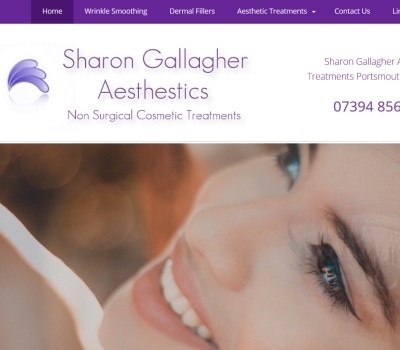 Sharon Gallagher Aesthetics is based in Bursledon, near Portsmouth and Southampton and provides a bespoke, professional service including high quality treatments from an experienced practitioner. Sharon takes pride in offering you a personalised treatment approach with exemplary aftercare support. Sharon offers wrinkle smoothing injections, for frown lines between the eyes, forehead lines, crows feet and laughter lines - Botox, is the popular wrinkle softening treatment approved for cosmetic use in 2006 under the brand name Botuline Toxin type A. Safe and straightforward, treatments can be used alongside other treatments such as dermal fillers to achieve an extremely youthful result. Botuline Toxin type A is injected into to the dynamic facial muscles responsible for the creation of wrinkles. Botox relaxes these facial muscles and keep them from contracting to restore a more youthful appearance. 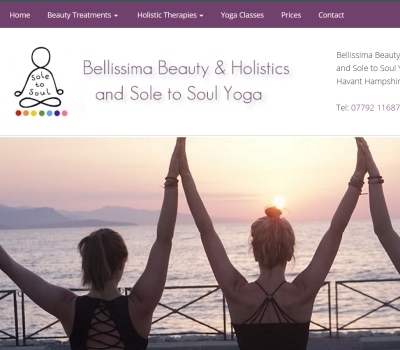 Internationally qualified Beauty Specialist and Yoga Instructor (MGBT IIHHT VTCT IHBC DipFRYOG) welcomes you to her secluded treatment room situated in a first floor annexe in the wooded grounds of Littlepark House, where peace and pampering are guaranteed. Jennie prides herself on her professionalism, experience and personal attention to detail using result driven, high quality beauty and holistic products from Dermalogica and Neal's Yard Remedies to leave clients feeling nurtured, with an enhanced sense of well being. As you take those special first steps into your life together, 'To Have & to Hold' is a helping hand to make them go with a swing... or a waltz, or whatever you choose! You have only one chance at a first dance. We offer our wedding dance lessons across all of Hampshire including, Portsmouth, Southampton, Fareham, Locks Heath, Whiteley, Warsash, Gosport, Sarisbury Green, Basingstoke, Denmead, Petersfield, Alresford, Fareham, Winchester, Kingsworthy, Titchfield and the Surrey border. We will bring the dance lessons to you in the comfort of your own home or to a venue of your choice. 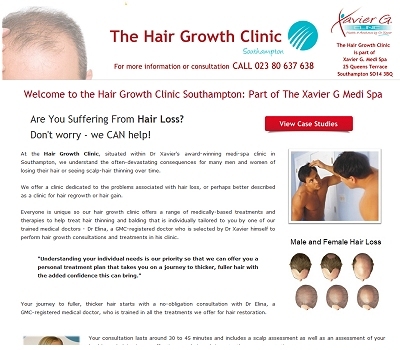 At the Hair Growth Clinic, situated within Dr Xavier's award-winning medi-spa clinic in Southampton, we understand the often-devastating consequences for many men and women of losing their hair or seeing scalp-hair thinning over time. We offer a clinic dedicated to the problems associated with hair loss, or perhaps better described as a clinic for hair regrowth or hair gain. Everyone is unique so our hair growth clinic offers a range of medically-based treatments and therapies to help. All Design & Images Copyright © All Rights Reserved - Web Designers Hampshire - Biz 1st for Business Start Ups - Mini Pixels Directory - Small Business Help.